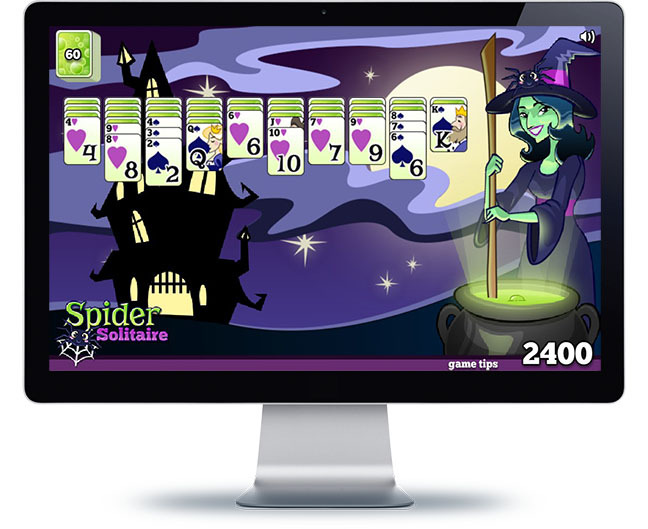 In this enchanted Solitaire game, the witch needs your help to create series of cards of the same suit in order to create her new magical potion inside her favourite cauldron. If you dare, try to clear the card field and achieve the highest score by creating chains of cards that are as long as possible. Have fun with this spooky and magical spin on traditional Solitaire! This game is a version of classic Solitaire: you need to create a chain of cards of the same suit, from King to Ace. Once you finish a series of cards, it will be placed automatically on the top row. You are able to place a card on top of another one that is a different suit, but you can only drag a series of cards all at once if they have the same suit. You can add new cards by clicking on the stack, but keep in mind that you can only do this six times, and the new cards will be added to every column.